Dual-enrollment. Dual-enrollment is when a high school student enrolls in classes at KCC at the same time he or she is still enrolled in high school. Dual-enrolled students traditionally spend part of the school day in class at their high school and part of the school day in class on campus at KCC. The first step to becoming a dual-enrolled high school student is to contact your high school guidance counselor and ask about dual-enrollment opportunities at KCC. More information about dual-enrollment at KCC is available online at www.kellogg.edu/high-school-dual-enrollment. Early College. Like dual-enrollment, Early College programs involve high school students enrolling at KCC while still attending high school. Early College programs generally begin during the student’s sophomore year of high school and run through an additional “fifth year” extending one year after traditional high school graduation. Early College students take a variety of KCC courses intermixed with their high school schedules and graduate after their fifth year with an associate degree in addition to their high school diploma. KCC currently has Early College agreements with a handful of regional high schools. For more information about Early College opportunities offered at KCC through your high school, contact your high school guidance counselor. High school articulation. While programs like dual-enrollment and Early College involve high school students taking KCC classes for college credit, high school articulation awards college credits for classes taken by the student at his or her high school. A high school student who successfully completes an approved high school course with a grade of a B or higher and also completes associated competencies to demonstrate his or her learning to KCC’s Articulation Committee is eligible to receive college credits for the equivalent course at KCC. For more information about high school articulation, visit www.kellogg.edu/high-school-articulation. 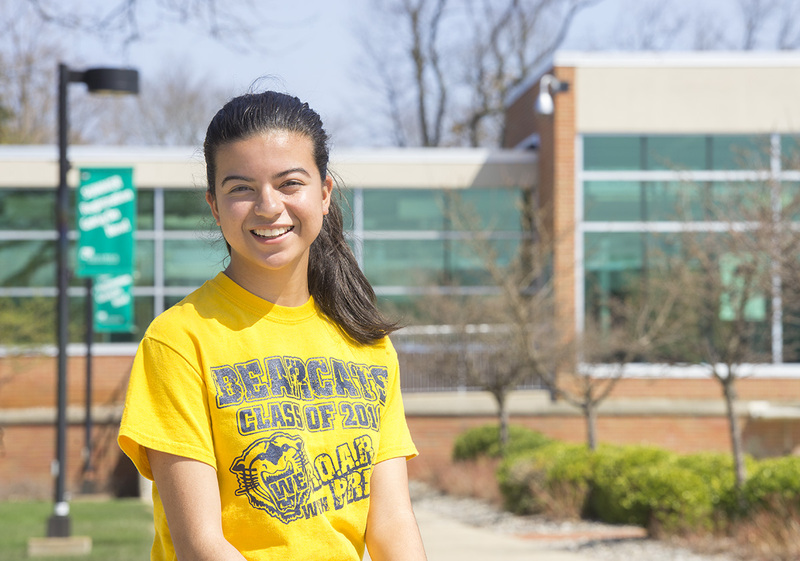 Pictured above, Battle Creek Central High School senior and KCC dual-enrollment student Yarielis Rosario poses at the entrance to KCC’s North Avenue campus in Battle Creek. Rosario, who’s president of Central’s National Honor Society chapter, a student government representative and a section leader in the marching band, plans to study environmental biology and premed after graduation, possibly at the University of Florida.